We’d love your help. Let us know what’s wrong with this preview of Her by Danielle Rose. Kemper Academy is over a hundred years old, but it has only recently reopened after a series of murders and stories of hauntings shut it down. Avlynn, a new student, refuses to let the rumors scare her, chalking them up to a bit of friendly freshman hazing. But when night falls and screams draw her from her room, she finds the truth is much more horrifying than any ghost s Kemper Academy is over a hundred years old, but it has only recently reopened after a series of murders and stories of hauntings shut it down. Avlynn, a new student, refuses to let the rumors scare her, chalking them up to a bit of friendly freshman hazing. But when night falls and screams draw her from her room, she finds the truth is much more horrifying than any ghost story. To ask other readers questions about Her, please sign up. Her is heart pounding and gripping! This one is creepy and intense! For anyone who loves scary stories, this one is perfect! I was unable to read any creepy books during October due to my schedule, so I was having a bit of Halloween withdrawal! This short story was perfect to quench my creepy thirst! It was well developed for its length. It kept building with the horror and suspense, and had a perfect ending. It definitely gave me the chills and raised my pulse a little! My only negative is that Her is heart pounding and gripping! This one is creepy and intense! For anyone who loves scary stories, this one is perfect! My only negative is that it was too short and I was left wanting an entire book (so, not really a negative at all)! I was such a quick, fun read, that I already want to read it again! My Halloween/Creepy Reads withdrawal is now officially satiated! Make sure you read this story! This is a paranormal horror short story. I would recommend this for young adults and older due to the graphic scenes. I really enjoyed the descriptive wording that the author used. A great read for Halloween! This book ended with me wondering what happens next? I see a wonderful series hopefully in the future. Avlynn is a freshman at a new school, Kemper Academy. She is anxious about being the new girl. Everyone knows the rite of passages dwelt by the seniors but she refuses to show weakness. W This is a paranormal horror short story. I would recommend this for young adults and older due to the graphic scenes. I really enjoyed the descriptive wording that the author used. A great read for Halloween! This book ended with me wondering what happens next? I see a wonderful series hopefully in the future. Avlynn is a freshman at a new school, Kemper Academy. She is anxious about being the new girl. Everyone knows the rite of passages dwelt by the seniors but she refuses to show weakness. Well until eerie things start happening all around her. Seeing is believing, right? Well things just got real. "A few curls of chocolate brown hair escaped her wimple, and her piercing blue-grey eyes not only glistened next to the gothic shade of black from her habit, but they seemed to look straight into my soul." What a great, spooky tale! Right from the start I got sucked in with Avlynn's story! I loved the ghost story over a campfire introduction and the way it quickly turns from light-hearted fun to horror! The perfect book if you're looking for something spooky & quick! (Thinking about opening a full-fledged horror novel? Check this out first!) I highly recommend you dive into this one to get you in the Halloween, spooky-kind-of-mood! Be prepared to want more of this wonderfully written horror stor What a great, spooky tale! Right from the start I got sucked in with Avlynn's story! Be prepared to want more of this wonderfully written horror story! This was such a creepy, short little story. I found it really fun! If you're looking for some creepy books to read (and it's a short one too), I would definitely recommend this one!! I would say something more about the story than the summary does, but because it's short I'm afraid I would ruin the story for you! But I recommend you read this for yourself!! I received an ARC in exchange for an honest review. I made no guarantee of a favorable review and the opinions expressed here are my own. This young adult short story was a fantastic read. Well written, paranormal story that was suspenseful and gave me goosebumps. I was definitely not prepared for the shocking and horrifying end. This is a five star story that readers will love. Word of advice: if you hear ghostly whispers; pay them no mind. A solid short-story, scary and chilling, and a great introduction to the author’s writing. It is a bit difficult to write this review without sharing any spoilers, as the story is very short indeed. Blink and you’ve missed it. Despite that, it is atmospheric, intriguing, and fairly dark (although there’s no gore involved at all, so don’t worry if you’re squeamish). The author uses many of the tropes of horror novels and films (an old gothic-looking property, a ghost story, night, cold, a daring y A solid short-story, scary and chilling, and a great introduction to the author’s writing. It is a bit difficult to write this review without sharing any spoilers, as the story is very short indeed. Blink and you’ve missed it. Despite that, it is atmospheric, intriguing, and fairly dark (although there’s no gore involved at all, so don’t worry if you’re squeamish). The author uses many of the tropes of horror novels and films (an old gothic-looking property, a ghost story, night, cold, a daring young girl who refuses to show others she is scared) and puts them to good use. The story is not long enough for us to get a great insight into the characters, although we easily identify with Avlynn, as we see all that happens from her point of view, we hear the screams, we realise our roommate is not there, we wonder which way we should go and we face… (No, I’m not telling you what). The twist at the end is perhaps not totally unexpected but it works very well and makes the story all the more chilling. Yes, we should remember that we ignore some warnings at our peril. A solid short-story, scary and chilling, and a great introduction to the author’s writing. Recommended to anybody who enjoys ghost stories, especially to those who like short reads and don’t want to get bogged down in too much backstory. I was given an e-copy of the story as part of a blog tour organised by Lady Amber’s Reviews & PR and I freely chose to review it. PERFECT! A stunning short story that would make you gaze around for ghosts. Perfect halloween read—with an amaaaazing ending that will leaves you gasping for air! Amazing! Truly wonderful! This was a quick read with just the right amount of scariness to make me tense, but not induce bad dreams. I enjoyed this story from the very first sentence. Ms. Rose clearly put thought into finding heavy duty words. Almost all of the sentences in Daemon Academy do more than just one job: character building, world building, atmosphere building, etc. Which is a very good thing, in this short story. (In any short story, really). My favorite part of this story was the way it fits within the horror genre. There was plenty of tension and atmosphere, a spooky setting and a great legend to go with it, and even a set of well-developed characters. Despite all of these elements that were appropriate to the horror genre, however, the gore level (and by this I mean level of description of blood, ghosts, hauntings, etc that make horror so horrifying) was at the perfect level for me. It was scary and other-worldly, but not graphic. The worst part of this story is that it ends. While nothing is as thoroughly developed as in a novel, the perception is that the depth exists for them. And then ending to the story certainly leaves me wanting to know what happens next (although this is a complete story). As this is a horror story, I believe it is important for parents to read this before letting their younger teenagers read it. It is a quick read, so won't take up too much of your time, and a read-through will allow you to gauge whether or not your child will enjoy this or be disturbed by this. You know your child best, after all. As a major scaredy pants girl, I was a bit afraid to dive into Daemon Academy, but it was worth the read, however short, it's such an enjoyable little treat in the Halloween season. Avlynn was a likeable character, someone I could sympathize with. I huddled in my chair and looked over my shoulder quite a few times while reading this. I found myself kept poking my e-reader to continue reading on the last page, and I'm sure I won't be the only one who feels that way after finishing this story. I wi As a major scaredy pants girl, I was a bit afraid to dive into Daemon Academy, but it was worth the read, however short, it's such an enjoyable little treat in the Halloween season. Danielle Rose's Daemon Academy is one of the best (in my own opinion, of course) short horror story, that came out just in time for Halloween. This is the perfect treat to read leading up to Halloween. Avlynn is telling us our scary story. Her story reminds me of the sleepovers we used to have at summer camp. I can picture reading this story around the campfire. We get the perfect ending for this story but I felt that it was cut short. I want to know what happens to our narrator once this story concludes. Expect to have this book finished in no more than an hour – if you read real slow. It’s listed as a horror book but I’ve read some th This is the perfect treat to read leading up to Halloween. Avlynn is telling us our scary story. Her story reminds me of the sleepovers we used to have at summer camp. I can picture reading this story around the campfire. We get the perfect ending for this story but I felt that it was cut short. I want to know what happens to our narrator once this story concludes. Expect to have this book finished in no more than an hour – if you read real slow. It’s listed as a horror book but I’ve read some that are much more frightening so adults may find it a little tame but for the teen in your life this may be just right – but don’t expect any nightmares. I’m not one that likes to have something that’s going to scare my socks off so this is just perfect for me. Maybe you have an older home like me and sometimes the stairs creak at night. What a perfect background noise or maybe even better is to put on a Halloween record as you read. Just don’t expect the ending to bring any closer to the story. To me it felt open ended. Danielle Rose is a super writer... When she wrote Daemon Academy now knows as "Her" Danielle pulls you into the story and when you are finished with the story she leaves you wanting more. I loved reading this short story. *Disclaimer: I received this short story as an ARC from Lady Amber’s Reviews & PR. The following review is my own with no input, compensation, nor promises from either Lady Amber’s Review & PR or the author*. This story is short, sweet, and to the point as the best ghost stories are. For being a short story there are many things I love about it, most I won’t share as I don’t want to ruin it for the other readers out there. This author brilliantly sets the stage from the very beginning and does not leave you hanging for long. It is a very quick and extremely entertaining read. One I will hold onto to read aloud at the next bon fire or ghost story telling. Loved it! 4.5★ for this short story!! Well, I'm not a fan of horror fics because they always freak me out, and I got the same reaction when I read this. BUT, it means that this story did a GREAT job because, obviously, a horror story was meant to be terrifying!! This story's synopsis was so attractive that I couldn't help but asked for an ARC from the author, and I totally do not regret it. The description was so vivid that you could image the scenes in your head, and you would definitely want to find out wha 4.5★ for this short story!! The description was so vivid that you could image the scenes in your head, and you would definitely want to find out what might happen on Avlynn, who was brought to the forbidden tower. I'm sad because this short story ended too quick : ( !!! I just finished reading a quick short story by @droseauthor, who is a supernatural romance author. This tale, however, is a cute little horror romp through the world of ghosts. The story only took me five minutes to read, so there wasn't much time for character development or backstory, but Rose does a wonderful job creating suspense rapidly and not letting the reader go until the final page. Ms.Rose, if you ever want to switch genres, I would say you are more than qualified, and could hold your I just finished reading a quick short story by @droseauthor, who is a supernatural romance author. This tale, however, is a cute little horror romp through the world of ghosts. The story only took me five minutes to read, so there wasn't much time for character development or backstory, but Rose does a wonderful job creating suspense rapidly and not letting the reader go until the final page. Perfect Short Story For Halloween Time! . . .
"Her" was the first book I've read by Danielle Rose and it won't be the last. This novel is short but enthralling. Centered on a Kemper Academy freshman named Avlynn, a student who refused to be frighten by firelight scare tactics, finds herself in a real life nightmare. Honestly, I re-read the last few pages of story because I was like "wait what just happened?!" I couldn't believe the story ended like it did and I would so read more in a heartbeat. Perfect Short Story For Halloween Time! . . . Honestly, I re-read the last few pages of story because I was like "wait what just happened?!" I couldn't believe the story ended like it did and I would so read more in a heartbeat. For a short story, Her had the elements of horror and suspense all over it. From beginning to end, I got chills. I got spooked. Even more so, I wanted more! This would be a great and eerie start to a horror novel. Danielle Rose has an incredible knack for writing stories that can get "under your skin." Just in this short story, there is ample world building and character development to get a full-length novel going. Her is a short story, says so on the book. Don't get snippy because it takes less than 10 minutes to read. This would be a good campfire story. It's got a creepy feel to it. Not what I call horror, horror is a word that is open to interpretation. I would literally define this as "scary campfire story", so I'm a bit disappointed it wasn't more horrorish. It's a cute, very quick read. Something to read to the kids during Halloween. This was a short spooky story, only two thousand something words. It was beautifully written, however, it wasn't scary for me. One thing I really liked was that the main protagonist wasn't dumb like they are in most horror movies. Still, she got caught up in this whole ghost thing. Though, I found the ending predictable I'm glad that I read it. I have been provided with a copy of Her by the author for an impartial review. I have recently been introduced to this author and this will certainly not be the last book I read by her. It takes someone really special to be able to grab your attention with a horror short story because they only have a few pages to grab your attention. This author did a fantastic job with this short story and I absolutely can’t wait to read more by her. A Short Story With A Bunch Of Spooky Character To It! I have been provided with a copy of Her by the author for an impartial review. This is horror short story and the first book that I have read by this author and it will certainly not be the last. This short story was so easy to read and super short that it left me wishing there was more. It had me from the very beginning. I can’t wait to read this author’s other books. This is an incredibly frightening short story that I absolutely loved reading! I am a huge fan of horror and this author definitely does not disappoint! My only complaint here is that it ended so quickly and I cannot wait for more from this author. I highly recommend this novella and this author to anyone who is a fan of horror. 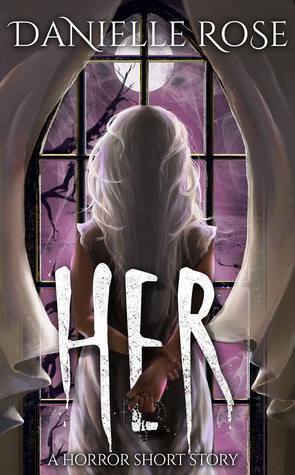 Her is a short horror story that will have you wondering what is going on and leave you wondering what happens next. Kemper Academy was shut down long ago but newly reopened with a haunting tale of murder and ghosts walking the hallways. I recommend this for older YA and lovers of horror stories. Wow! That was an intense, spooky read. Danielle Rose packs quite a punch in a few short pages. She has a great opening for a new horror novel should she decide to explore it. HER, is a perfect spine-tingling campfire story. This is a really short story and the ending is really abrupt and leaves you hanging. But, having said that it was really well written and the story is so intriguing, the ending frustrated me. I want to see what happen's next.